We spent a week learning about los sentimientos. The boys and I really had a fun time with this topic. Below is an outline of our lesson. **Note: The activities listed below are not the ONLY Spanish activities we do throughout the day. We also intersperse the Educazion.net lessons, videos, books, computer games, songs, etc. These are just the activities we completed under our theme of Feelings. First I said each vocab word one by one. After each one the boys would act out the emotion. We did this a couple of times. 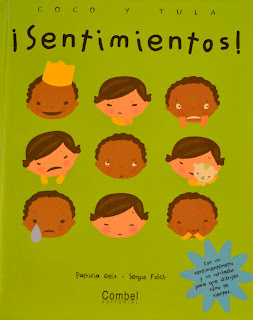 Next I had black and white outline pictures of some of the emotions we were discussing (feliz, triste, contento, regular, emocionado, enojado, sorprendido, asustado) for the boys to color. I also had labels for each emotion that I had printed on Avery label sheets. Once they were finished coloring, we labeled each emotion, then matched up the ones that were opposites (or somewhat opposites) and glued them back-to-back on a popsicle stick. Neither one of my boys love to color, oh well! I gave the boys different scenarios (in English) and they had to hold up the emotion they would feel for that situation. For example: Your ice cream cone falls in the dirt. When they held up the emotion they would feel, we all said it in Spanish. Then I asked, "¿Qué es el opuesto?" and we would all say the opposite. This is a great book for discussing emotions and how you feel in various situations. There is a spot in the back of the book to draw the emotion, with dry-erase, that Coco is feeling. Here is the link to it on Amazon. On day 2, we reviewed the vocabulary by playing charades, a game we all love. As I mentioned in my post on Easy Spanish BINGO, I created emotions flash cards using clipart from Microsoft Word and Avery printable business card paper. We used these cards to play charades. Since the pictures on the cards are obvious, my 3-yr old could play without much assistance. Although we had previously talked about masculine vs. feminine endings, it's always good to review grammar points and point out new situations in which they apply. Before we had talked about gender with relation to physical characteristics. On day 2, we applied the rule to emotions. Since my kids are so young, we don't spend much time on grammar points. I feel like if they hear the rule several times along with its correct usage, they will pick it up without having to drill and kill the point. So, we limited our grammar lesson to practicing saying how various people were feeling with either an "o" or "a" on the end depending who we were talking about. I used the emotions flash cards as we were talking to allow the kids to visualize the emotions as we discussed them. To start our vocab review today, we played one of our favorite games, BINGO. Once again, I used the cards that I described in my previous post found here. Then, as if BINGO weren't enough fun, we took the cards out of the plastic holders and played Go Fish. We worked a little grammar into Go Fish by practicing asking, "Tienes _______?" and answering, "No, Vete a pescar" or "Sí, lo tengo." Do you see a trend here? We try to review vocabulary every day. The more the boys hear each word, the more likely it will stick in their heads. On day 4, I allowed the boys to each choose a review activity. My oldest chose charades and the youngest chose memory match. I explained to the boys that in Spanish some words are different depending on if you are speaking with an adult or another kid and that it was similar to calling adults Miss/Mr./Mrs. in English. We talked about Tú and Usted when asking someone how they are doing. After that we did some role-playing, taking turns asking "¿Cómo estás?" and "¿Cómo está?" while pretending to be different people. 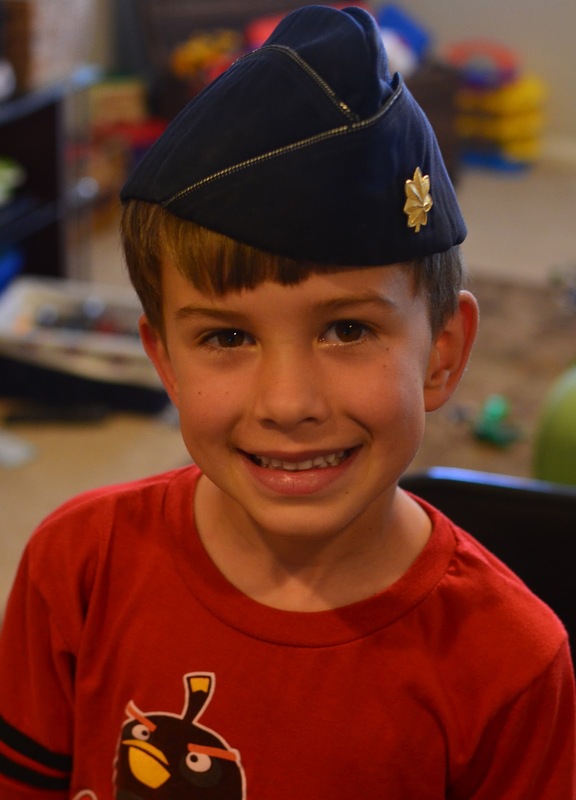 I let the kids take turns wearing some of their daddy's accessories when they were pretending to be an adult. I try to make our last day of a lesson a fun, review day. For our feelings unit, we made puppets out of fuzzy socks, googly eyes, foamies, and yarn, and then had the puppets ask/answer how they were feeling.